Charles Serle Lloyd was given a large chunk of land running from behind the Red Lion in Witts End to Higher Rads End, and then on towards Palmer’s Shrubs, according to the Enclosure Map. According to the Accounts and Estimates, a parliamentary paper for the 23 Jan 1810 to 21 Jun 1810 session, he was first clerk in the Comptroller’s Office, and was paid £200 for each of the three years ending 5 Jan 1808, 5 Jan 1809 and 5 Jan 1810. The same document describes some hair-raising chicanery as quite normal – someone being employed to do a government job; then that person arranging for someone else to stand in for him, at a fraction of the salary, while he stays at home and keeps the rest of the salary; then formalising this so that the government pays out the two parts of salary directly; then the regulation requiring his employment being abolished, so he really should be redundant, but only the deputy who actually does the job is fired, and the first chap goes on staying at home and getting his part of the deal; and this going on for decades; and then the government buys its way out by buying an annuity for the chap, because otherwise it would be “a hardship”! And this was normal! The document Public Offices for the session 23 Jan 1821 to 11 Jul 1821 notes that Charles is still being paid his £100 per year superannuation. Charles was involved with various Crooks (people whose name was “Crook”, of course. What else could I mean?) and Ebsworths in a chancery division court case in 1816 indexed here. The actual records are on parchment and the National Archive takes 3 days to find them! CHARLES SEARLE LLOYD of Islington, Middlesex. Gent. Lawyer. Trustee for Eversholt Estate of William Crook of Tytherton Lucas, Wiltshire, Gent, in 1805. Devised to MARY SUSANNA CROOK (formerly Bayliffe) for her daughter Mary Susanna Ebsworth. Unmarried. So Charles was a lawyer, and William Crook, who lived in Wiltshire, had some land in Eversholt, and Charles handled it for him in 1805. Charles was a relative of Crook, somehow. So is that why Charles was granted land in Eversholt in 1808? What land did Crook own earlier? Here are the two blocks of land that Charles was granted in 1808, marked out on the parish paths map. lands at Eversholt, Beds., which had been devised to her by Charles Searle Lloyd, then late of Islington, Middx, Gent, lawyer, as trustee to William Crook to hold for her daughter Mary Ebsworth. “Devised to her” means “left to her in a will”, so, presumably, Charles had died by this time. This family tree page (from Australia!) shows Mary Susanna Crook marrying Thomas Ebsworth (1772-1838) and bearing him ten children. The second of these, Mary Susanna Ebsworth, was born on 5 Mar 1813 and christened on 20 Apr 1813 in St.Matthew’s, Bethnal Green. 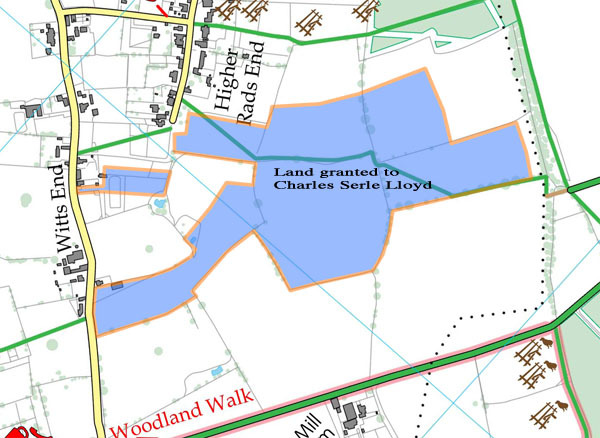 Maybe this land at Eversholt, left so easily by one rich person to another, was the land given to Charles at Enclosure. What was Charle’s connection to the village? Did he live here? Did he make good use of the land? Or was this just another bit of chicanery? Mary Susanna Crook, neé Bayliffe, (1764-1836) was the widow of Thomas Crook (1749-1821) of Tytherton Lucas, Wiltshire. There must be something wrong here, because she cannot have married Ebsworth too! There must have been a daughter, birth name Mary Susanna Crook, who married Ebsworth. Freebmd says that Mary Susanna Ebsworth died in Calne, Wiltshire, registration district, in Q3 1843, and this was presumably the woman who was the wife of Thomas Ebsworth. The London Gazette notes that her husband, Thomas, died in 1838. I (EJW) could find no useful records at all linking anyone called “Ebsworth” with Eversholt. I can’t find any records at all for the Mary Susanna Ebsworth born in 1813. Ah, yes. First there was (a) Mary Susanna Bayliffe (1764-~1836), who married in 1787 Thomas Crook (1749-1821) to become Mary Susana Crook. She gave birth to a child, (b) Mary Susanna Crook, (? – 1843), who married in ~1810 Thomas Ebsworth (1772-1838) to become Mary Susanna Ebsworth. She gave birth to a child, (c) Mary Susanna Ebsworth (1813 -?). Charles left the Eversholt land from the Enclosure to (a) Mary Susanna Crook nee Bayliffe to hold for her daughter (b) Mary Susanna Ebsworth nee Crook. Why on earth he couldn’t just give the land to (b) is beyond me. What happened to it after then is unknown. Did Charles develop the land and employ workers? Did he ever visit Eversholt? Did either Mary Susannah? No idea!